This is NOT packing light! As I looked at the mountain of gear that we packed for a three-day trip to the beach, I thought, as I always do in these cases, “What is going on here?! ?” Granted, we had Jeff’s music gear and that was way over the top compared to what we usually take, but still, I alone had packed my big backpack, my laptop/electronica backpack, a bag with my hair dryer, towels and ugg boots, a bag with magazines and knitting project, and a bag of coats, hats and other winter gear. All for THREE DAYS! 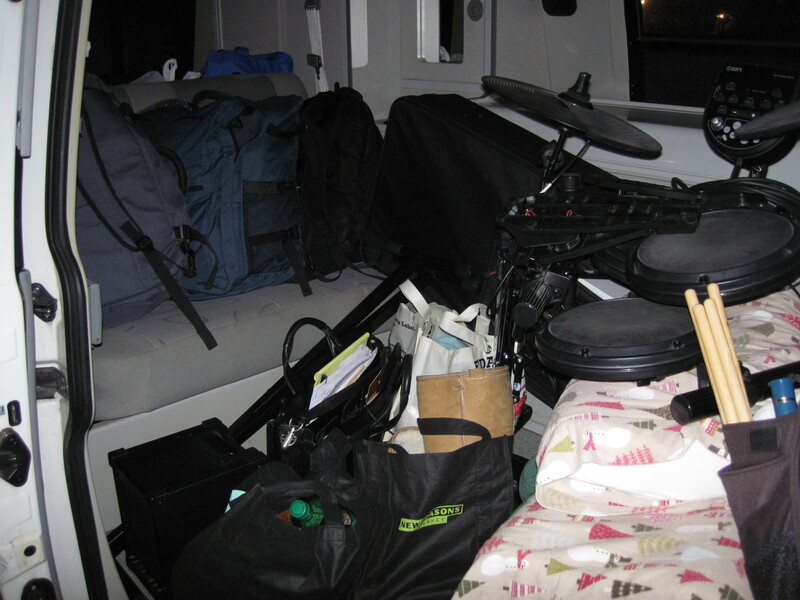 Aside from the music gear, Jeff’s pile was smaller (but he sneaked some gear into my bags, too!). And we had food to pack. We had to drive the VAN to fit it all. This was not a recipe for packing light! So how have two people who have to take this much gear to the beach for a weekend managed to travel to Europe, Africa, and Australia, for five, six, and even eight weeks with all our gear packed into one large backpack and one daypack each? Answer: no keyboards! In all seriousness, though, there are a few tips and tricks that include a lot of versatile pieces of clothing and a bottle of hand washing laundry soap. The rolled clothes take up only about 1/3 of my pack. 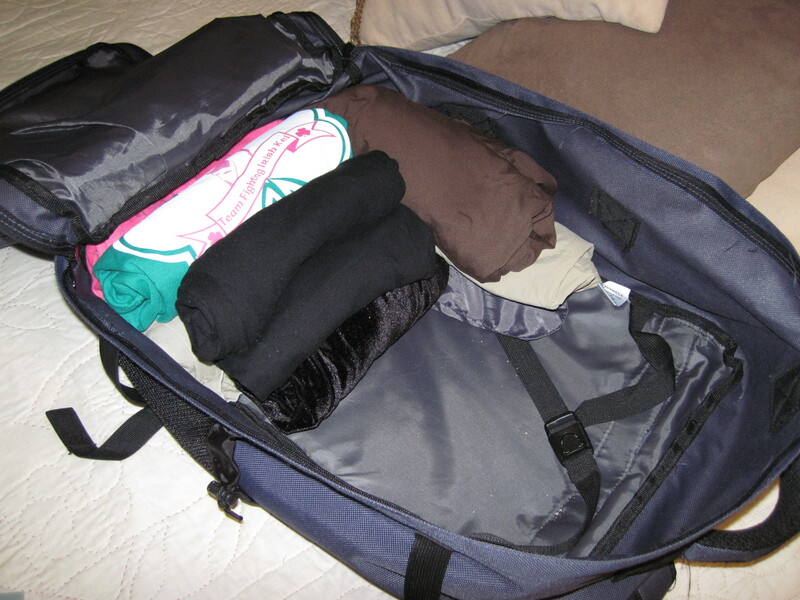 The best trick for packing that we know of is rolling your clothes instead of folding. This is a tip we got from travel guru Rick Steves. Rolling your clothes allows you to fit more clothes in the same space and it helps prevent wrinkling. Speaking of which, I am also a big fan of wrinkle-free or at least minimally-wrinkling travel clothes. My favorite travel dress is lightweight, wrinkle free even if I were to wad it up in a ball, and cost me $14.00 at Ross! 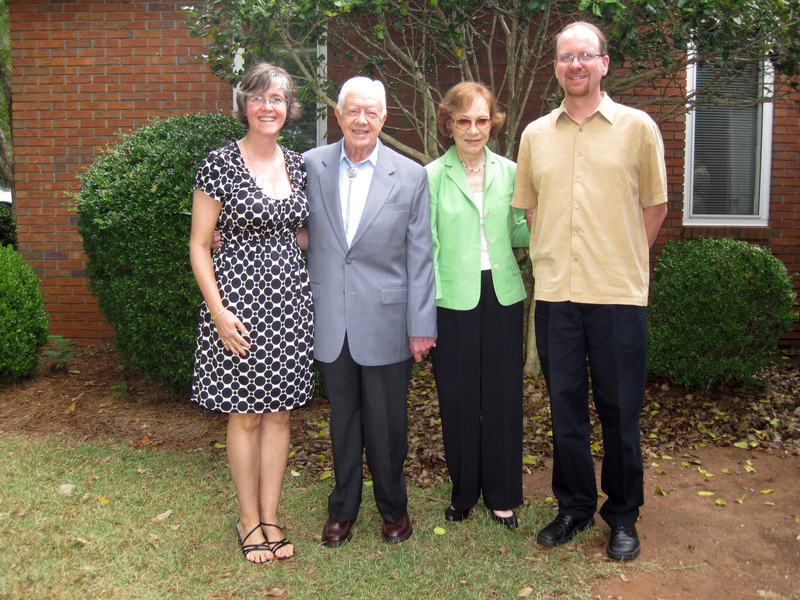 It also looks good enough to meet President Carter, if I do say so myself (see photo!). We’ve also used compression bags that roll up to squeeze the air out. These work pretty well, although sometimes they don’t want to stay sealed. We still roll our clothes inside them to protect from wrinkling. They also help keep things organized! 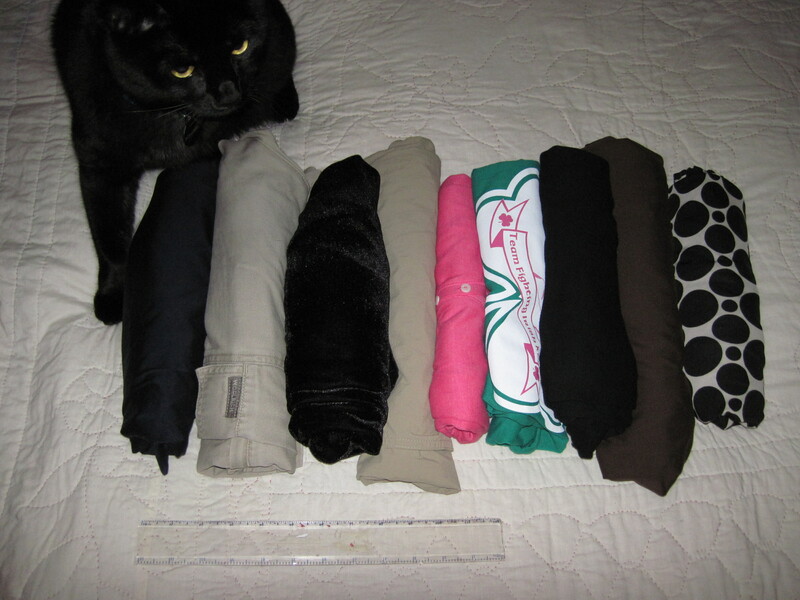 Packing clothes which can be layered for warmth is helpful when packing for colder climates. I am a huge fan of my new long underwear from Columbia because it’s lightweight, super warm, and black, so it won’t show the dirt! As long as I’m not going anywhere fancy (rarely a problem in our travels), the shirt can also double as a regular long sleeved shirt, too. The same is true of my Mountain Hardware Butter Zippity. Warm, never wrinkles, and it has the added bonus of those awesome little thumb holes — it’s almost like having gloves with me. When we traveled to Australia in winter, I wore my butter zippity with a light sweater over it nearly every day. Did you read that carefully? I wore the same thing nearly every day. This is a key component of being able to pack light. You must be willing to wear the same things, because you’re not going to bring too many things along. “But don’t you get sick of wearing the same thing every day?” Sometimes, YES. And there are garbage cans in Europe that will attest to that. More than one shirt has been tossed at the end of a long trip, but that gave me room to bring a new souvenir shirt home, right? Win-win. 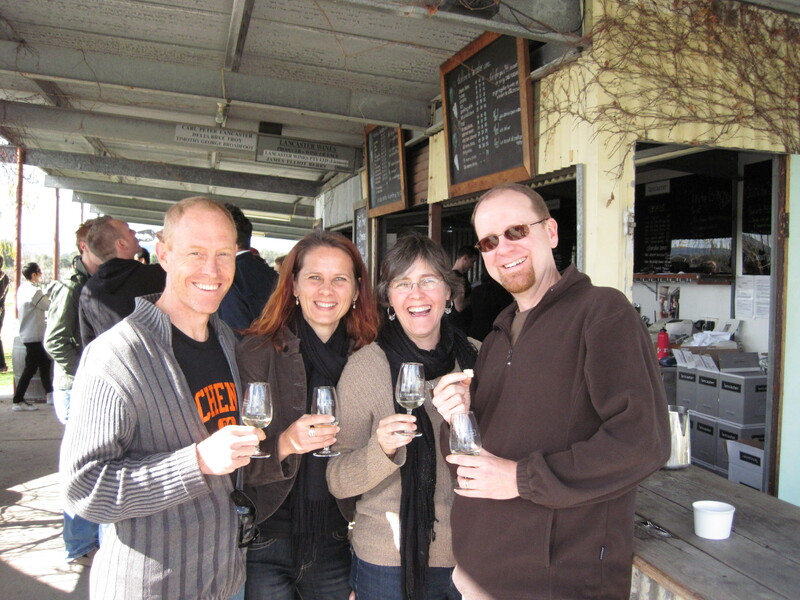 Wine tasting with friends in Perth, Australia. I have on my Australia uniform – butter zippity below soft, snuggly brown sweater with a scarf. I did bring two scarves to change things up a little. Jeff didn’t bring enough warm clothing on this trip, so he purchased the fleece in Sydney. Winter is actually cold in Australia! How can you keep from getting sick of the same old thing? Accessorize! One of the best fashion trends for light packers is the scarf. Pack one or two scarves — that take up hardly any room — and you’ve got a whole new look even though you’re wearing the same shirt you were yesterday! They can also double as a light wrap if you’re traveling in warmer climates. A few (only a few!) pieces of jewelry can have the same effect and again take up very little room. For guys, depending on where you’re traveling, a change of hat might do the trick — hats are becoming quite hip for guys these days (even Jeff has some cool ones!) and many are quite packable. A tie might do the trick, too, if dressing up is in your plans. So what do we typically pack for a long trip? Again, we go to Rick Steves for his packing lists. (Of course Jeff has put the list into a spreadsheet for our own personal use.) Interchangeability, as I mentioned, is key. If I am bringing only four shirts, which is typical for a 4-8 week trip, at least three of them must go with all my pants/shorts/skirts. A sweater or light jacket should go with most everything, too. The scarves can tie things together, too. 2 long sleeved shirts, 2 short sleeved shirts, 2 pairs of pants, 2 pairs of shorts, 1 dress. The basics. all rolled = about 24″. Shoes are a problem, especially if you’re big on shoes, because they take up a lot of room and they’re heavy. Even if I went to Alaska, for example, I wouldn’t bring my uggs (Emu brand, made in Australia, not China), even though I’d want to. I do my best to get by with only two pairs. I bring one pair of Fit In Clouds foldable ballet flats for dressing up or one pair of light, flat sandals if we’re going to a hot place, and one other pair of shoes that have to work for everything else and which have to be comfortable for walking…and walking…and walking. This is usually my biggest challenge, and I am rarely completely happy with the “look” of my shoes with my outfits, but as long as my feet are happy, I’m willing to capitulate on fashion. No one who knows me thinks of me as a fashionista anyway, and most of the people I meet on my trip will never see me again, so why worry about it? We do lots of hand washing of clothes in hotel room sinks (we carry a small elastic laundry line with little suction cups on the ends) and try to find a laundry at least once or twice to get stuff really clean. When we took our niece to the Virgin Islands, she was appalled by the idea of hand washing! It’s really not that bad. Light, synthetic fabrics tend to dry faster, and that’s important to think about ahead of time. We try to use biodegradable soap like Trek and Travel that are friendly to the environment and a little easier on our clothes, but I’ve even resorted to shampoo when necessary, too! Speaking of which, travel sizes of shampoo, soap, and toothpaste are all we ever take with us when traveling. For one thing, the airlines make it pretty difficult to do anything else if you’re carrying on, but also it’s a fun adventure to go to the store somewhere and see what you can find in their toothpaste aisle. Support the local economy and live like a local! Maybe you can’t live without your favorite moisturizer, but would you be willing to try some European shampoo? Maybe you’ll find a new favorite! Electronics and camera gear are big space hogs and especially problematic for me because I never want to miss the perfect picture. We’re also pretty addicted to the Internet. We do, of course, take cameras and technology with us, and of course that means all kinds of cordage and batteries. I try and find the smallest bag I can to stuff all these things into. It’s a lot easier to hunt through my big bag looking for the one small bag that holds everything than it is to hunt through the big bag to look for loose cords or battery chargers. We really prioritize and plan to bring the minimum we can get away with while still making sure we have what we need. 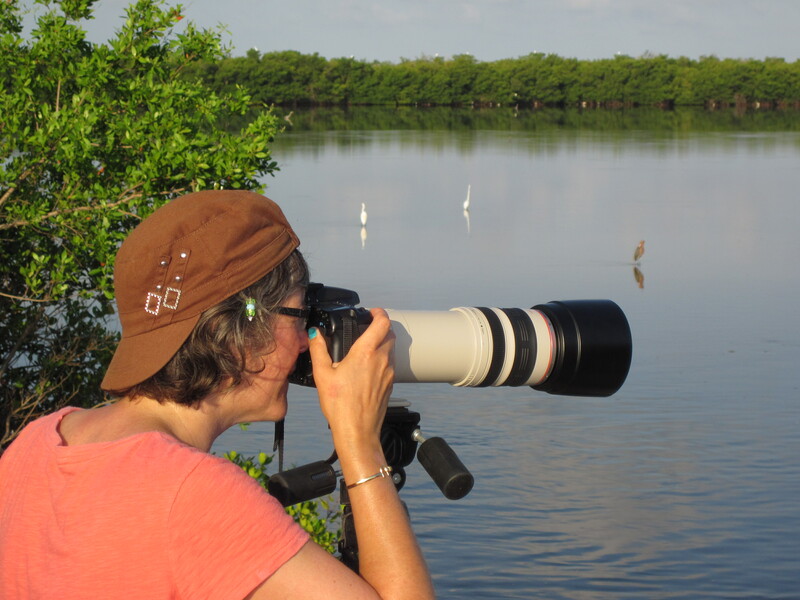 Do I need both of my zoom lenses AND a wide angle to photograph birds? Probably not. Do I need a tripod to shoot birds? Yes! Would we like to have our iPod speakers with us on the beach in the Virgin Islands? Yes! Is bringing them along with all our snorkel gear practical? No. Can we live without them? Guess we’ll just have to be lulled by the ocean waves. Oh wait, that’s why we’re going there, isn’t it? Let the experience of your vacation be your priority, not checking your Facebook or wearing the perfect shoes with every outfit. You’ll be surprised at what you can live without. I know I always am, as much as it might kill me to admit it. Do you have a traveling light packing tip? Leave us a note in the comments. And enjoy your next trip, whether it’s for a week or a weekend!